Peter Salerno Inc. Featured By Design NJ: Fall 2015 – Design Your Lifestyle. October 2015 October 2015 Peter Salerno, Inc. Thanks to Design New Jersey for Peter Salerno Inc. Design Feature! The official Peter Salerno Inc. blog has covered the fabulous Design New Jersey magazine in the past, and we’re happy to do so again. Most recently, a fall 2015 social media feature on Design NJ’s Facebook page focuses on a custom kitchen design by Peter Salerno Inc., focusing on some of Peter Salerno’s award-winning custom kitchen design elements. 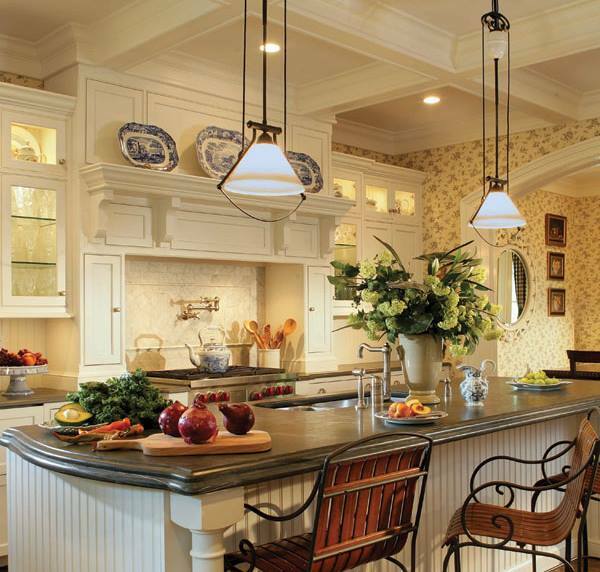 The kitchen design (pictured in this article) contains several Peter Salerno Inc. trademarks – custom cabinetry and kitchen island, bold accent lighting, beautiful coffered ceiling, and handcrafted custom display cabinets with recessed interior lighting. This feature from Design NJ is the latest in what has been a rewarding 2015 design year for Peter Salerno Inc. From multiple national awards from the NKBA, to being named a finalist in the Sub-Zero and Wolf design contest, to partnering with Miele on a new showroom vignette, to feature layouts from renowned publications like Design New Jersey, Peter Salerno and his team feel truly blessed. If you’d like information on a custom kitchen design of your very own (anywhere in the world), please contact Peter Salerno Inc. by filling out the form below or by calling (201) 251-6608. ← Peter Salerno Inc. Reviews: Read The 5-Star Testimonials Here!